We opened our store in 2015 and are here to stay. As the “new guy” on the block, we are determined to earn your business. Whether you need a short-term loan or just want to sell your item, we are confident that you will be more than satisfied with our pay-outs, interest rates, and customer service. 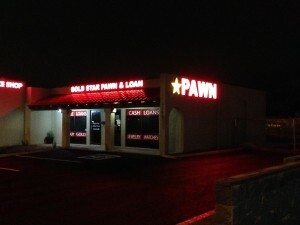 We are a full service Scottsdale pawn shop located on the Northwest corner of Scottsdale and Thomas Rd. What we do is provide money to people who would like to sell their valuables as well as lend money to people who are in need of a short-term loan. If you want to sell – we buy. If you need a loan – we lend. There is no credit check when getting a loan. We don’t care about your financial status or who you know, we simply look at what you bring in. There is not much limit to what we will buy and loan on. Browsing through this website will give you an idea of what types of things we’re looking for, however, it is not everything. In addition to buying items and loaning money, we also have merchandise that we sell. On any given day, you can come into our pawn shop and find gold, silver, jewelry, electronics, guitars, TVs, smartphones, watches, diamonds, tools, clothing accessories, and more that are for sale on our showroom floor. Stop by our store anytime to see what we have to offer.